You have completed the works for a customer and the status of the corresponding job has been set to Completed. Turn ON the integration between Xero or QuickBooks Online and Loc8, it is an important prerequisite for Invoices feature to appear in your application. It's easy to turn on the integration, please follow the steps given in the article Xero to Loc8 or Xero to Quickbooks Online integration. STEP 1 Go to the Invoices page. 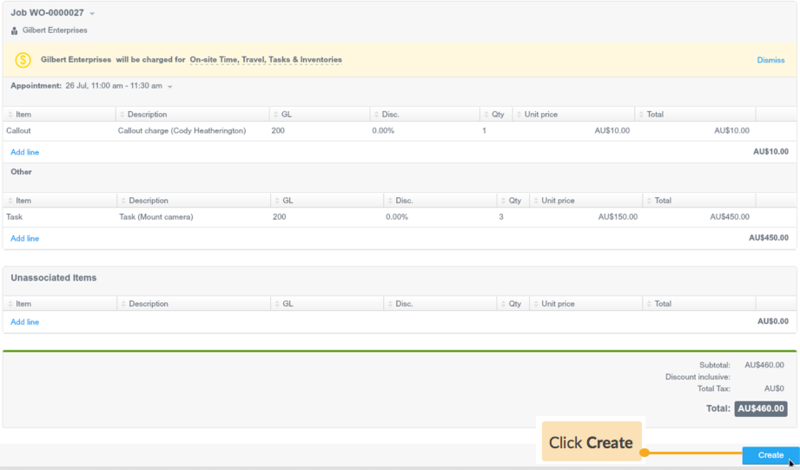 STEP 2 Open the Invoice creation wizard and fill in the customer details. INFO: The new customer contacts in an invoice will be sent to your integrated accounting software (Xero or Quickbooks Online) once the invoice is created. STEP 3 Add the jobs to be invoiced. 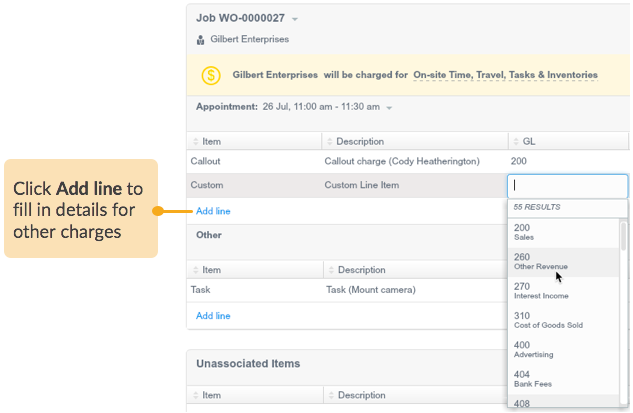 STEP 4 Review the displayed line items and if required, you may add other additional charges here. STEP 5 Create the invoice. 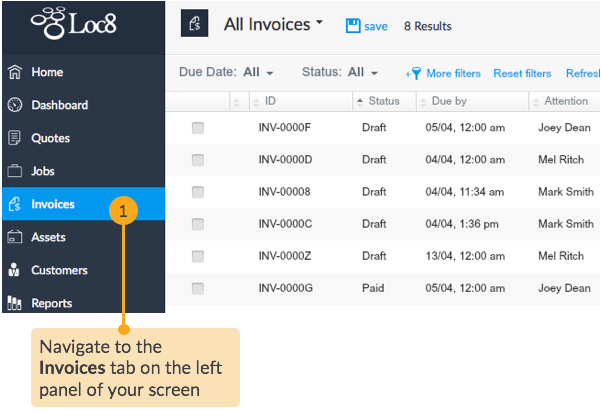 The new invoice will now be available in the Invoices tab as draft. 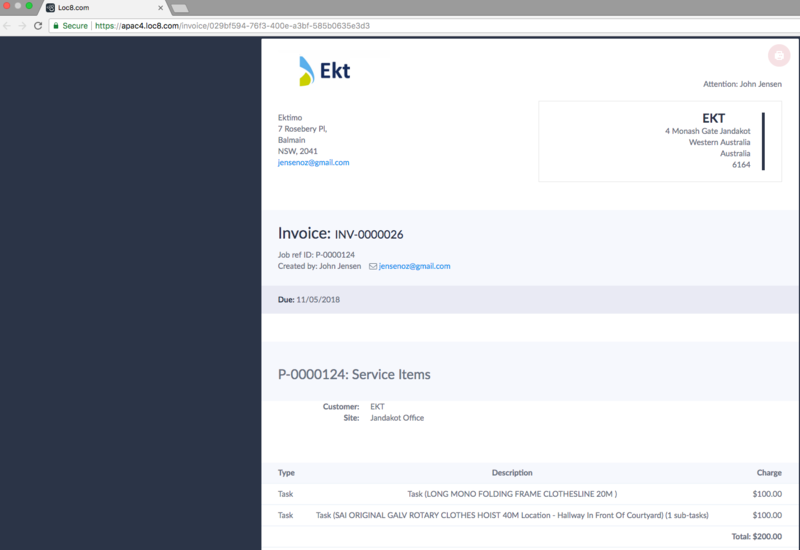 The details of the invoice will be accessible to you as a live html file, no matter what the status of the invoice is in. You can use the web link to share it with another contact, save the invoice as PDF or print it out. The next step is to log into your accounting software (Xero or QuickBooks Online) and carry out the processes of settling finances with the customer. This has been discussed in detail under the Integrations section, all changes in the accounting software will be updated constantly in Loc8, so you'll have the invoice status or addition of line items in Loc8 in sync with that in Xero or Quickbooks Online.